The worth of data logging when modifying cars is now common knowledge. Programmable engine management systems have in-built logging facilities and many factory management systems with aftermarket programming software can log engine signals. 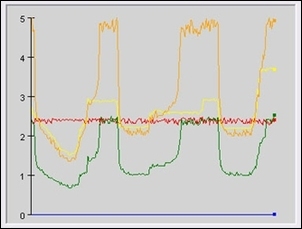 Even cars with just an OBD II port can have simple, low speed logging performed of certain engine management parameters. But what about if your car fits none of these categories? Or you have an OBD port but want higher speed logging? In the past it’s been hard to come up with a simple and cheap way of logging signals – but now there’s a new product on the market that achieves just this. It’s not perfect – it won’t log frequency signals like engine revs for example – but the price and ease of use still makes it one very useful product. 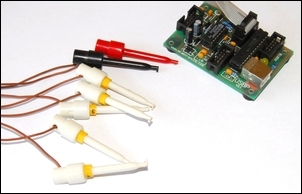 It is also ideal for monitoring battery voltages and the like. The logger is produced by eLabronics and was developed as a result of their involvement with educational electronics, especially in schools. 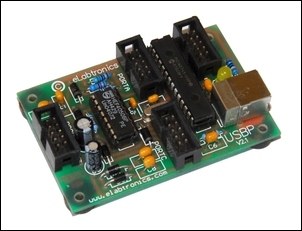 The company realised that with the writing of some software and some other slight adaptations, an existing product (a PIC programming board) could be easily altered in function to become a five channel, 0-5V USB data logger. Schools were crying out for such a tool that could be used to monitor the functioning of projects like solar cars, programmable robots and so on. The data logger, complete with USB cable, software and 5 probes, costs just AUD$86.90. The logger comprises a small PCB 75mm x 50mm. It is supplied without a box, so you should either wrap it in insulating tape or find a box to place it in. The input signals must be in the 0-5V range. Plug one end of the USB cable into the logger and the other end of the cable into the PC’s USB port. The yellow LED on the logger will light up. ....and this display will appear. Press the ‘Start Recording’ button and the monitored voltage will be displayed and a graph of the logged value will be drawn. Press the ‘Show Log’ button and the data readings (and the time at which they’re taken) will be shown in another box. 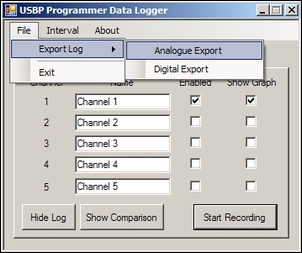 After the ‘Stop Recording’ button has been pressed, you have the option of exporting the log file. This is done by File > Export Log > Analogue Export. The file is exported as a .csv file that can be read in Excel. Note that this is the only way of saving your logged file! 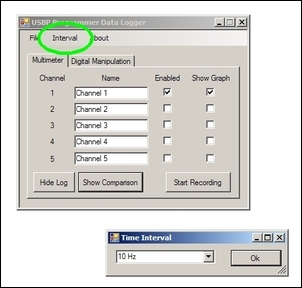 By clicking on the Interval button the sampling speed can be set at any of eight values - from 10Hz (ie 10 times a second) to once every 10 minutes. The default is 10Hz. Note there is also a faster setting than 10Hz – it’s called ‘Max’. Maximum is the fastest that the particular PC and USB interface can run at, and also depends on how many channels are being monitored. On my PC, monitoring one channel, ‘Max’ was 16Hz. In all cases, the logged record shows the actual timing values that were used when the data was collected. 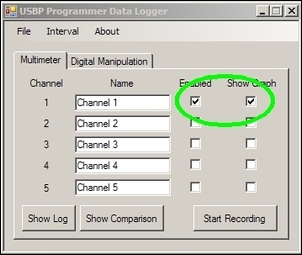 If more than one channel is to be monitored, additional input probes are connected and the respective channels activated in the software. 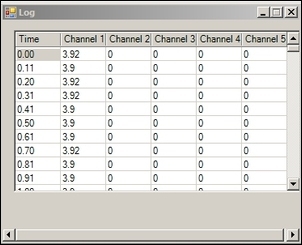 Up to five channels can be monitored real time and logged. The channels can also be graphed on the one display – press the ‘Show Comparison’ button to do this. Note that in this logger application we don’t use the ‘Digital Manipulation’ function of the software. This is a very simple logger – and that makes it very quick and easy to use. It can monitor up to five channels, allows you to set the sampling rate to the required application, has effectively no limit to the data it can collect, and the log file can be exported for graphing or other analysis in a spreadsheet program. Next week: using the logger and working with input voltages higher than 5V.